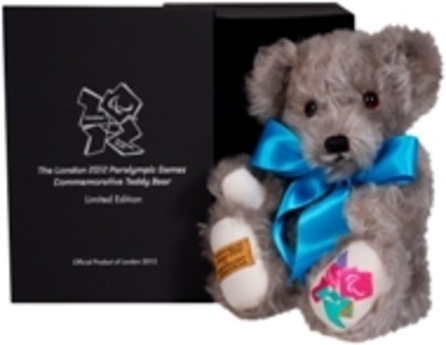 This beautifully made in England teddy bear has been specially designed to commemorate the London 2012 Paralympic Games. He is based on a design from 1948, the year of the revolutionary Stoke Mandeville Games which inspired the Paralympic movement and, ultimately, our modern Paralympic Games. This special bear is made from the softest grey mohair and cream-coloured wool felt. His fully-moveable paws and hand-embroidered nose and smile really bring his personality to life, whilst a silky satin ribbon completes his look. Sure to enchant anyone who takes him home, this adorable little bear represents a unique piece of London 2012 memorabilia. He is individually numbered and one of a Limited Edition of just 2012 pieces. Comes in a special box.